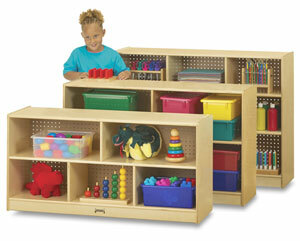 Designed with smaller children in mind, these units are ideal for nursery, daycare, or preschool. Durable KYDZTuff finish wipes clean with ease, and KYDZSafe edges are rounded for maximum safety. All feature KYDZStrong hardwood, dowel-pin construction with hardboard recessed backs and are caster-mounted for mobility.